Today I will share an experience story from Emma. I photographed her little newborn baby girl. It was exciting to try some new ideas and poses. I got the list of poses family wanted and got told that big bunny is coming for the photo session along too. I have always been not so keen on large plush toys, but to be very honest I was very chuffed with image we created for Emma. Families always have questions about newborn baby photo sessions. I have made a page where some of those questions are answered. Check most common baby photoshoot questions. Session went really calm and with occasional settling breaks. We made a beautiful newborn baby photo gallery. Emma also talks about the experience to have my assistant on the set too. Pretty much always I have one on hand and families love to just sit down and have a relaxing few hours on sofa. Little baby did all poses we wanted and even allowed us to try new set ups. This doesn’t happen that often and you will see probably the best case scenario for newborn photography session. Have you ever wondered what it’s like to come for a newborn baby photo session at A-Fotografy? Here is what Emma said about her experience. 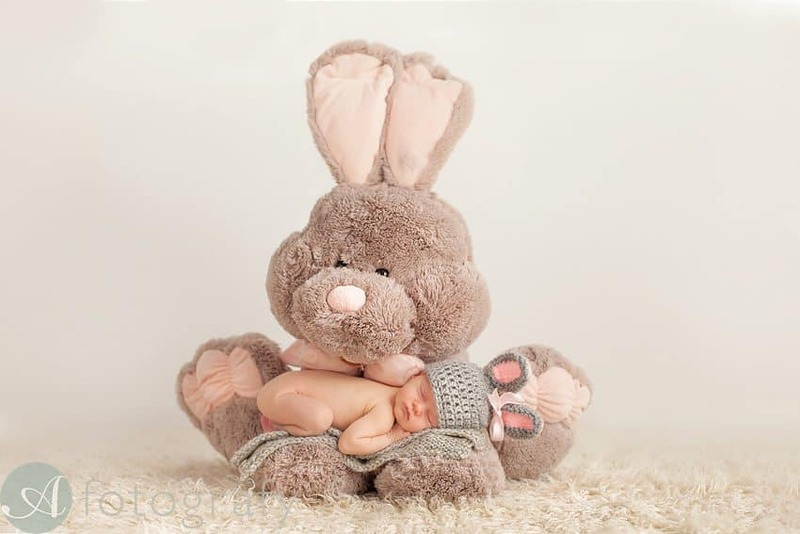 ” We had a newborn photo shoot done at A-Fotografy and I cannot recommend highly enough! From the moment I enquired about an appointment, the communication from Armands was amazing and this continued through to the point that we received our prints and CD images. On arrival at Armands studio, his assistant (who was formally a midwife, which gave us a massive amount of confidence that our new baby was safe and being looked after) took our little one and got her ready for the shoot, we took a seat on the comfy sofa, relaxed and watched on in amazement at the poses Armands was able to get our daughter into for pictures. We provided Armands a list of poses we wanted which he did in addition to some new ones he wanted to try out. We also took a number of props which meant something to us and Armands was able to create amazing photos utilising them, he is very creative! The photoshoot lasted 4 hours and as you can imagine a brand new baby with no nappy for that period was going to have some accidents, however, Armands and his assistant were so relaxed and proactive that this was not a problem and all accidents were cleaned up and antibacterial put into all affected surfaces. Time was also given to feed the little one multiple times through the session and no pressure was put on me to do this speedily. Armands assistant was also fab in giving me bits of advice as a new mother e.g breastfeeding, from her previous experience as a midwife. Armands turned edited the photos and turned them around within less than a week which was so quickly compared to other photographers utilised in the past. In addition, he provided us a sneak preview of four images on the day of the shoot on his Facebook page which was wonderful. There are a large number of packages available depended on budget and we selected a photo on and the disk of large digital images which were turned around quickly and the quality was excellent. We were also given a number of options for a thank you gift from Armands and a thank you letter when we received our pictures for utilising his service which just further enhanced the feel of a personal service. The photographs are amazing and we have had nothing but positive comments from friends and family with a number of friends signing up for pictures of their little ones to be taken. Thanks again Armands and assistant, great experience!!! newborn girl posing in froggy pose on pink background. Advanced newborn posing. newborn girl sleeping on scales in edinburgh studio. mum kissing baby during photo session. Black and white portrait. little newborn baby size bed with baby sleeping in bed. Emma will enjoy these images many many years ahead. You can fin out about my newborn photography by visiting my newborn photography page here. To finish to this lovely experience post here is the slideshow I made for them too. Enjoy watching and check my newborn photography page above.